Iliotibial band syndrome (ITBS) is an overuse injury mainly affecting runners. The initial treatment is conservative. Only, in recalcitrant cases surgery is indicated. Several open techniques have been described. 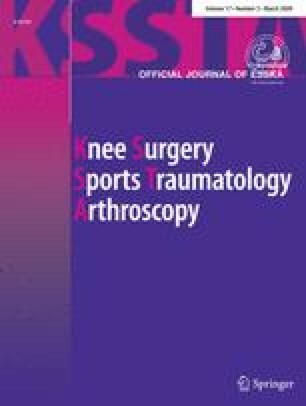 The purpose of this study is to evaluate the results of a standardized arthroscopic technique for treatment of a resistant ITBS. Thirty-six athletes with a resistant ITBS were treated with a standardized arthroscopic technique, limited to the resection of lateral synovial recess. Thirty-three patients were available for follow-up (mean 2 years 4 months). Thirty-two patients (34 knees) had good or excellent results. All patients went back to sports after 3 months. In two patients a meniscal lesion was found, which required treatment. One patient with only a fair result had associated cartilage lesions of the femoral condyle. Our results show that arthroscopic treatment of resistant ITBS is a valid option with a consistently good outcome. In addition, this arthroscopic approach allows excluding or treating other intra-articular pathology.